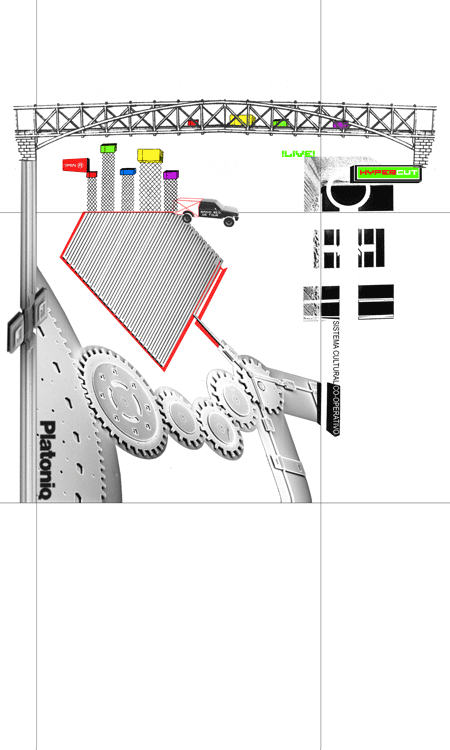 Platoniq moves as much in the land of the communication as in the field of the digital creation. It looks for to create bridges between the work of cultural agent and producer. The central point is the interaction between the new technologies, the popular culture and the social event, with the intention to establish connections between Internet/new media and public physical space. Platoniq works in different areas: the organization of events related to culture and technology (ie cycle of electronic arts and media cultures), the creation of documentary contents for TV (ie Neue Kraft Neues Werk - Transcoder Express) and radio in Internet and the development of tools (database and software for public use). Radiored is an independent project of radio in Internet by Platoniq. Their contents are centered in news articles on digital culture, the social impact of the technology and contents of electronic music. On the other hand Radiored behaves like tool and context to develop - to gather part of the new uses of audio in Internet. This project has a structure of database that allows that the reception is not linear since one of the characteristics that Radiored power is that the receiver also happens to be publisher of contents. In this line they have developed the public tool "Hypercut", a compiler of archives of audio in Internet. With this tool any internaut can create "play lists" of audio real and mp3 located in any server and automatically to make them consultables from Radiored.org. The idea starts off to understand Internet like audioteca and to the "audience" like "broadcast" publishers and producers. Platoniq presentation in *straddle3* - friday april 11, 2003 at 20h . Plus the projection of "Harriaren errezistenzia", in hommage to sculptor Jorge Oteiza died this week.